The Hakushu [hack-shu] distillery was built in 1973 by Suntory, it's second Japanese malt distillery after Yamazaki. It once boasted the title of worlds largest distillery with a whopping 36 stills! A downturn in demand saw that reduce to 12 active stills, incorporating 4 different shapes. They use both unpeated and peated malt and mature in 5 different cask types (though they concentrate heavily on two) allowing them to make 40 different whiskies to mix and match from. The Hakushu single malts are mainly created from 3 styles of whisky - unpeated single malt matured in hogsheads, unpeated single malt matured in ex-sherry butts and peated single malt matured in ex-bourbon barrels. 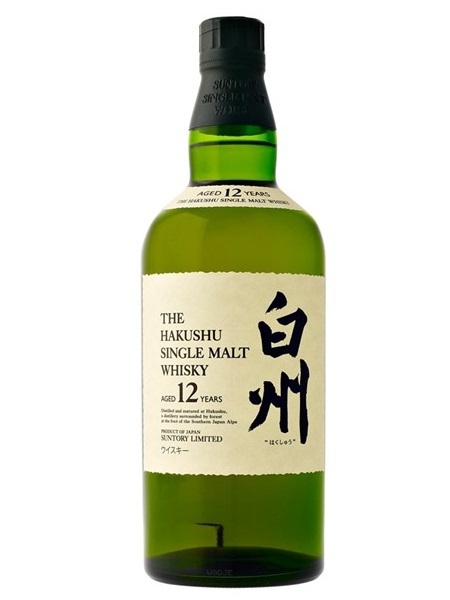 These malts are vatted together to create the lightly-peated, Hakushu 12 year old single malt. It is bottled at 43% ABV.